Mizuma Art Gallery is pleased to present AOYAMA Satoru’s solo exhibition “News From Nowhere”, opening on Wednesday 20th September. Aoyama’s copiously prolific artistic activity has continued apace this year, encompassing amongst others his participation in the group show “ESCAPE from the Sea” in Kuala Lumpur, the Yokohama Triennale, and his two-person exhibition with musician Ikeda Ken at Mizuma Gallery, Singapore. 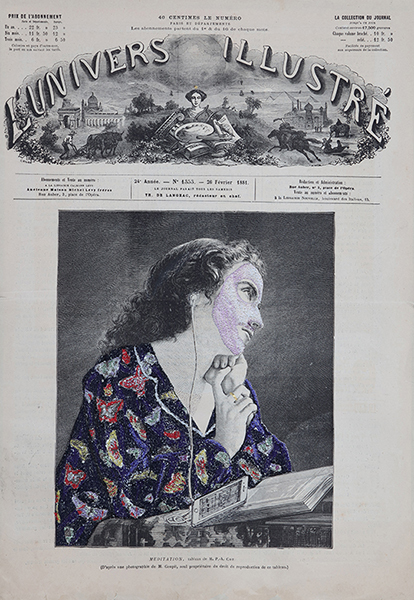 For this exhibition, Aoyama presents 30 new works in which he manipulates 19th-century vintage prints from Victorian Britain, applying to them elements of collage, drawing and sewing machine-rendered embroidery. Contemporary female figures whose work traverses the fields of fashion or pop culture seem to have passed through a time-warp, their chronological context changing to the 19th century as they appear within the prints. For Aoyama, who originally studied textile arts with a partial focus upon gender studies, this theme is one that has been developing within his practice over many years. The exhibition’s title, “News From Nowhere”, is taken from the title of a novel written in 1890 by the artist and poet William Morris. This book, within which the narrating “I” is transported in time from the 19th to the 22nd century, at a glance seems like a bizarre vision of the future as a pastoral utopia, yet it also enabled Morris to express his own critique, as an active Socialist, of modernization’s transformation of the world into a capitalist society. At the foundation of these alluring portraits of pop icons thus lies Aoyama’s critical percipience of both our world today and the future that lies ahead of it. On show at the same time as this exhibition, in his presentation at the Yokohama Triennale 2017, Aoyama presents artwork in the form of a personal history, featuring his own grandfather who was a painter. This work, also entitled “New From Nowhere” is even more deeply engaged with imaging political concerns. Viewers are warmly encouraged to complement your viewing of this exhibition with Aoyama’s Yokohama Triennale artwork as well.